Time is money. This is especially true of routine immunostaining assays. Thus, we are pleased to introduce you to EZ-HRP™ Polymer Detection. EZ-HRP™ Polymer Detection's features allow its users to save time, and as a result, money. 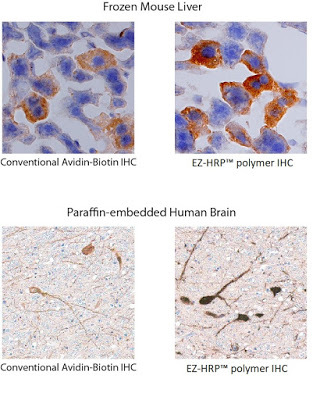 Image: Comparison of IHC images using EZ-HRP™ Polymer vs. a conventional avidin-biotin antibody. Does not produce non-specific background staining Can be used on unfixed or chemical fixed (formalin, formaldehyde, alcohol, etc), paraffin-embedded and frozen tissue sections. EZ-HRP™ Polymer Detection is just of of many new products we are continuously adding to improve your research results.